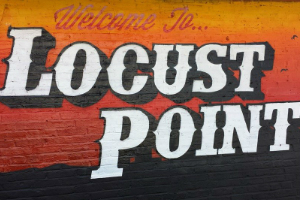 Located in Southern Baltimore, the Locust Point traditional boundaries are Lawrence Street to the west and the Patapsco River to the north, south, and east, allowing for beautiful views of Downtown Baltimore. Locust Point is steeped in not only history, but in community. A neighborhood nestled at the end of a strategic peninsula, it is home to both Under Armour in the former Proctor & Gamble soap factory and Fort McHenry, the birthplace of our National Anthem. The neighborhood also once served as a center of Baltimore's Polish-American, Irish-American and Italian-American communities; being a point of entry for immigrants. Even with industry surrounding it Locust Point is a vibrant neighborhood. It is a mix of some of the city's oldest row houses and the new with - high-tech office, luxury urban high-rise living, and shopping available. Latrobe Park is also an easy walk from anywhere in the neighborhood. It has a dog park, playground, basketball courts, tennis courts, a baseball and soccer field as well as a rec center. The MTA Bus #1 route runs right through the neighborhood making connecting to other party of the city easy. With great people, great green space and many amenities. It is a great neighborhood to explore and enjoy!